Chile peppers have only been in Asia for several hundred years now, but they have gone a long, long way to become standard and staple ingredients in many of Asia’s great food cultures. Southeast Asia is of course full of chile pepper connoisseurs, with particular numbers in the countries of Indonesia, Thailand, Laos and Cambodia. 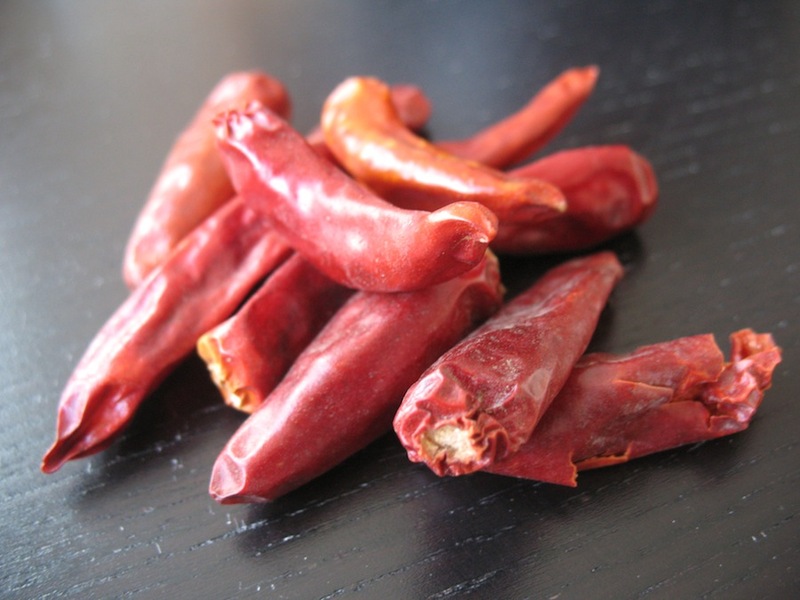 China’s west-central region is also deeply involved with the chile pepper, where they use fresh, dried, and pickled peppers with traditional dishes (Sichuan and Hunan have many famous examples). And South Asia’s regional cuisines are also known for their fiery spice. 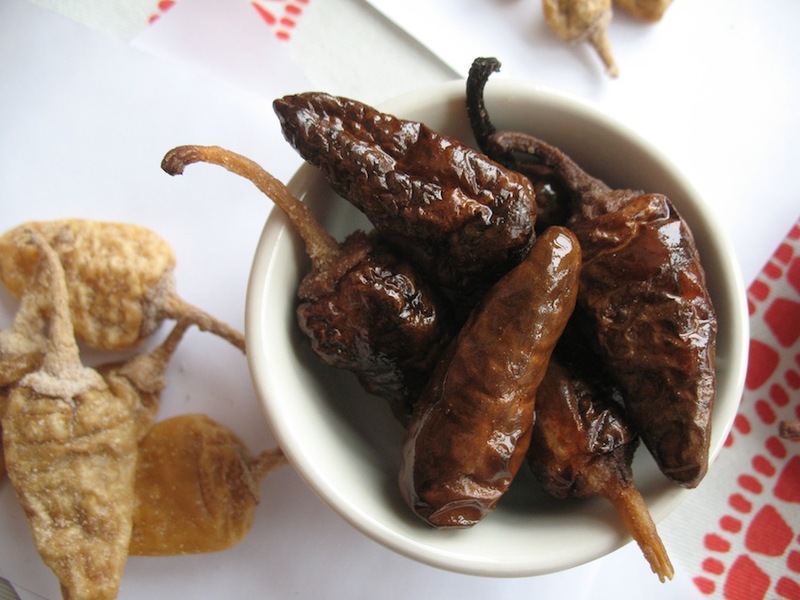 From Kashmir to South Indian buttermilk-cured chiles (see below) to the world’s hottest pepper, the “ghost pepper”, South Asia’s culinary traditions showcase great diversity with the chile pepper. For those of you who are really into Sichuan cooking, this is a must have. These are dried peppers from Sichuan province, and they are similar to standard dried red chiles (usually chile arbol) available in most US markets, but they are a little fatter and milder. Because of the mild nature, it is a great pepper to use for almost anything. I toss them in with stir fries often, whole or cracked. 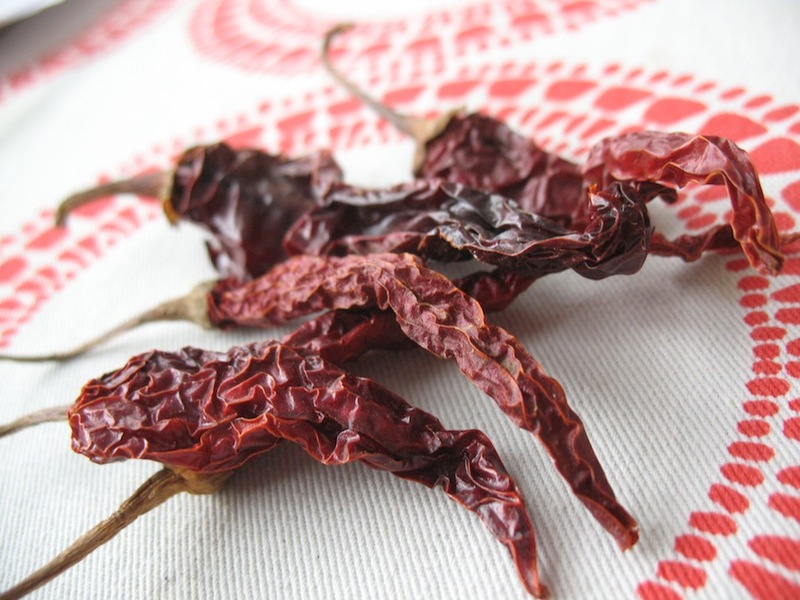 One key Sichuan pantry item that is made from these chiles is red chile oil 红油. This is a must for Sichuan-style cold salad dishes, like cold jelly noodles, cold cucumber salad (which is basically that cold jelly noodle sauce over cucumber slices), and cold meat dishes. 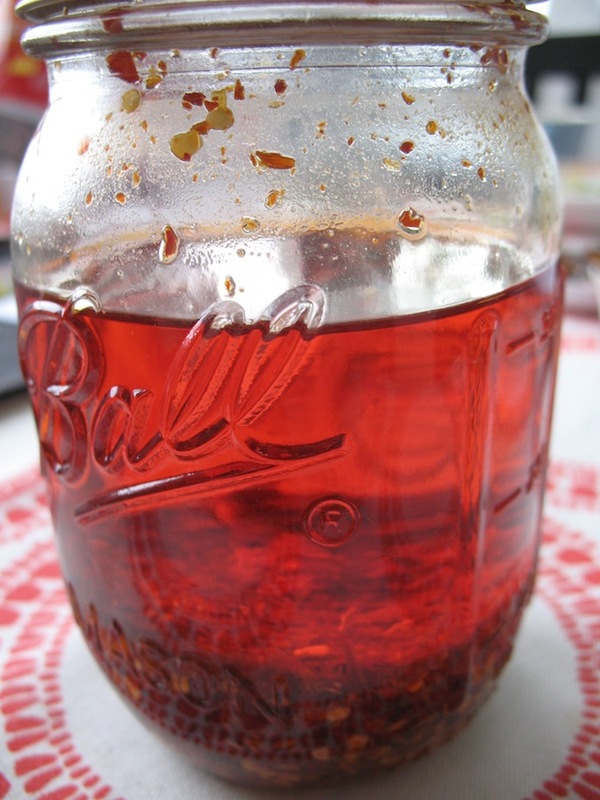 Chile oil is simple to make. 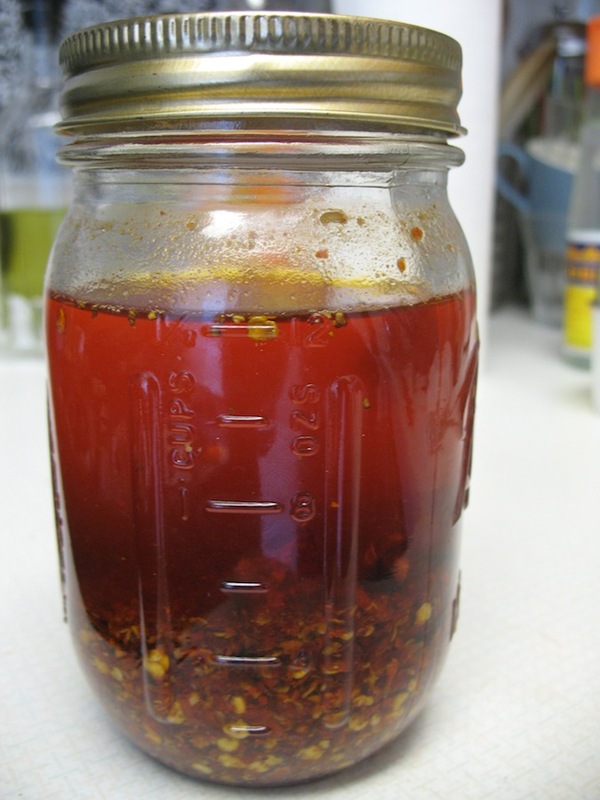 Get some peanut oil smoking hot, take off heat for 10-12 minutes, and pour into a jar that is a third full of chile flakes. Let it sit for a few days and it’s good to use. 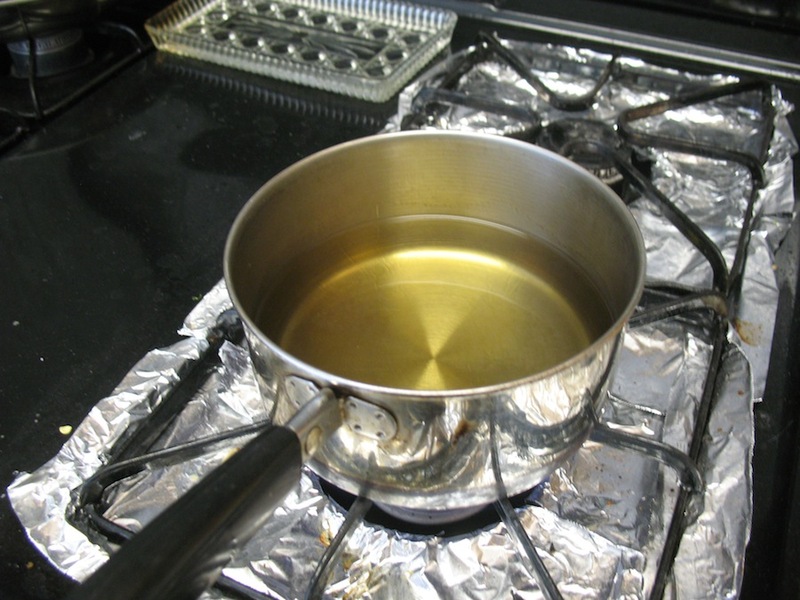 Some people flavor the oil more with garlic, ginger, huajiao, and other aromatics too. 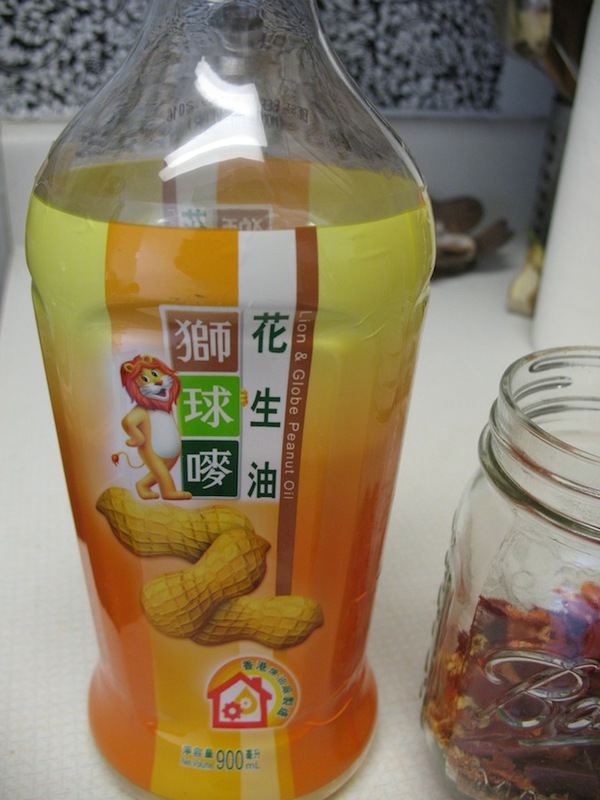 If you are new to Sichuan food, and want to learn more, including more detail on staple items like chile oil, I highly recommend Fuchsia Dunlop’s Land of Plenty. 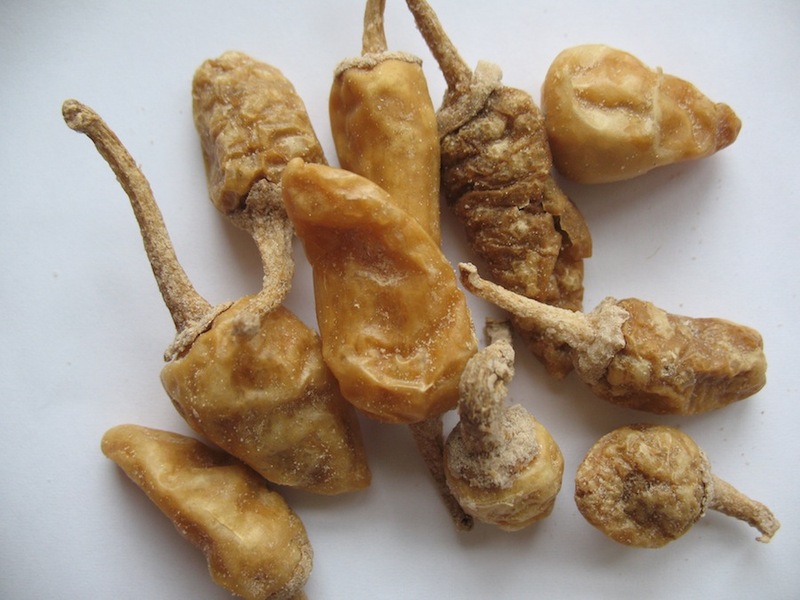 Surprisingly, I haven’t seen “Facing heaven” peppers available at most Chinese markets. Most markets just carry peppers from South America. The one market that I see regularly carrying them is the Hong Kong Market in North Philadelphia. 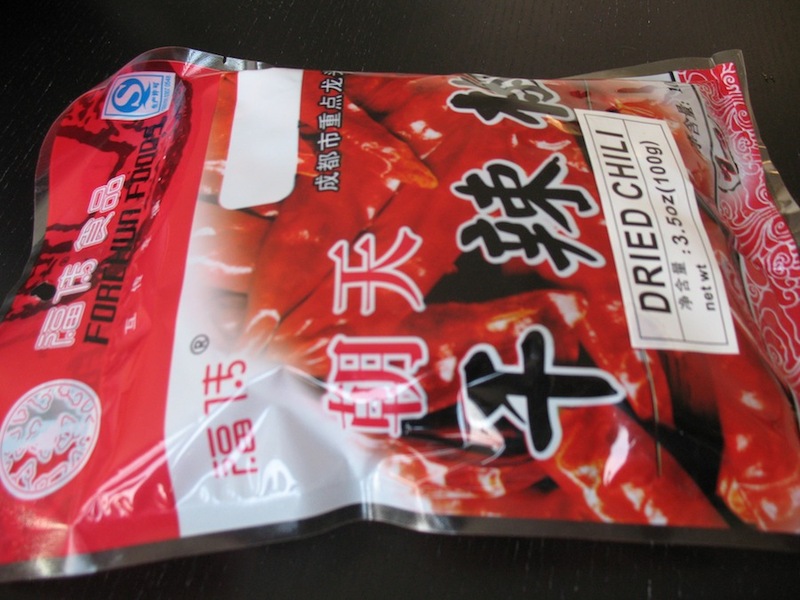 Unfortunately, there isn’t usually anything in English on the packaging besides “dried pepper”. Look for the characters for “facing heaven” 朝天. These cute peppers are spicier than the “facing heaven” peppers. These are great to fry with the spiced tempering that goes into a dal at the end of the cooking process. They are also nice-looking whole and fried together with leafy green vegetables. I found these peppers at Dana Mundi, near University City in West Philadelphia. They are a product of India, but I don’t know if they are characteristic of a particular region’s cuisine. Last weekend I took a drive up to Northeastern Philadelphia to look at a few markets. One such market, Kashmir Garden, surprised me with many interesting items–not from Kashmir or North India–but from Kerala and Tamil Nadu regions of Southern India. This very unique chile is a popular preparation in South Indian cooking. In Tamil it is known as Moor milagi மோர் மிளகாய், in Telugu as majjiga mirapakayalu మజ్జిగ మిరపకాయలు, and in Malayalam as tair mulak തൈര് മുളക്. I think this item in Hindi is Dahi Mirchi (“yogurt pepper”). 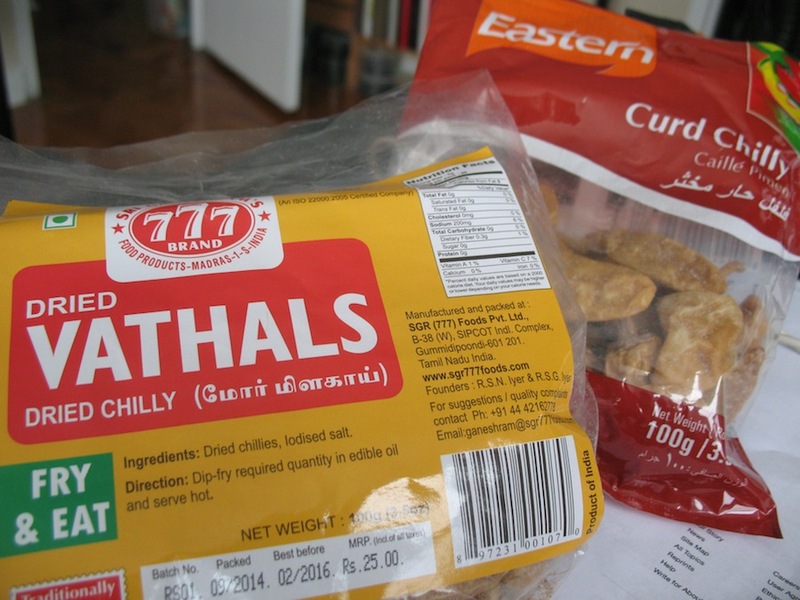 The bag calls these “dried vathals” or “curd chilly” in English. These are hot chile peppers that have been soaked and fermented in buttermilk or salty yogurt for several days before being sun-dried. The soaking in sour milk or yogurt actually bleaches the chile white. They turn reddish/golden after you fry them again in oil. I was surprised by the flavor of these, and perhaps more surprised how salty they were. The insides are packed with salt (see close up image below). I wonder if these are maybe best consumed with some comparatively blander dal or rice dish. 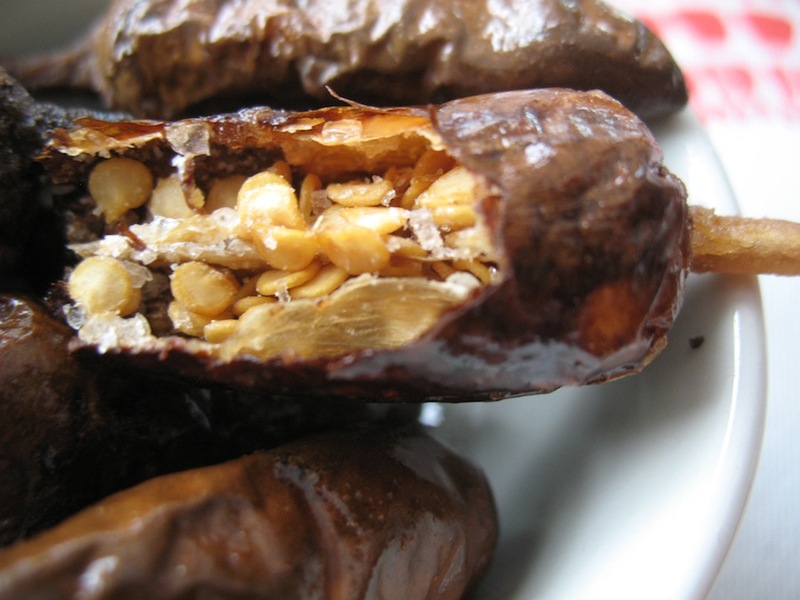 There are many recipes that I found for making these at home from fresh green chiles. If you are curious about the process, check out “sun salutations” at Mahanandi’s blog. Another good source is Chef and Her Kitchen. Finally, I found Kashmiri peppers (one of the few things I found from Kashmir Garden that was actually from Kashmir–via South India). I haven’t cooked with these yet, but they are supposedly good for the deep red color that they impart to dishes. 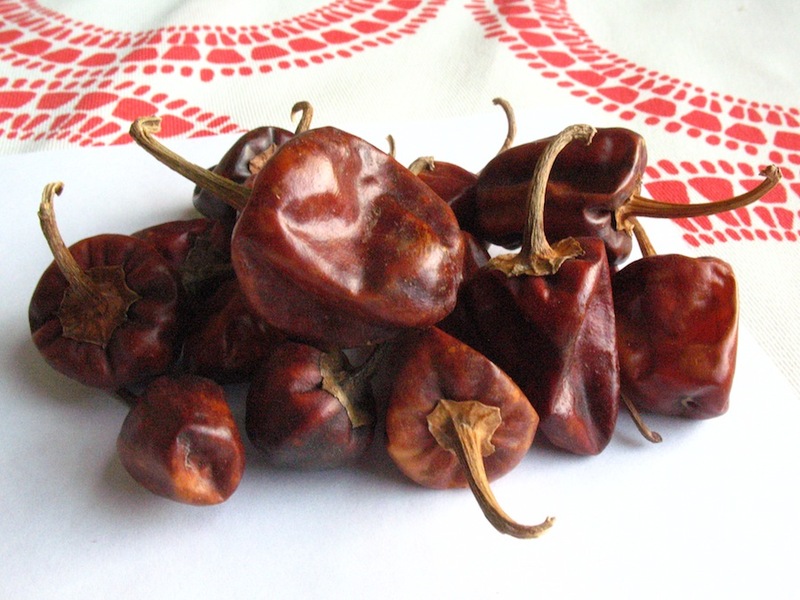 These peppers are easily recognizable due to their deep red color and shriveled skins. This entry was posted in - Featured Food Discoveries, - Featured Markets, - Recipes, Chinese food, Indian food and tagged buttermilk, buttermilk cured chiles, chaotian pepper, chili, chilly, curd chile, dahi michi, dried chiles, 辣椒, facing heaven pepper, Kashmir pepper, majjiga mirapakayalu, moor milagi, Sichuan, South Indian, Szechuan, tair mulak, Tamil Nadu, vathals, 四川, 朝天. Bookmark the permalink. Which market around Philly did you find the facing heaven chili at? I’ve been looking off and on for a while now. I find them pretty consistently at Hong Kong Supermarket at 571 Adams Ave, in the Rising Sun Plaza. So far that’s the only place I’ve spotted them.